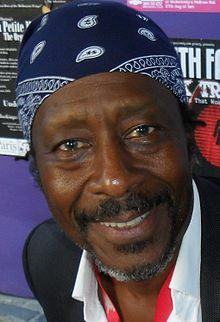 Peter Clarke (born April 7, 1952), known professionally as Clarke Peters, is an American actor, singer, writer and director, best known for his roles as detective Lester Freamon and Albert "Big Chief" Lambreaux on the David Simon HBO dramas The Wire and Treme, respectively. More recently, Peters has portrayed Alonzo Quinn on the CBS crime drama Person of Interest and Isaiah Page on The Divide. Peters was born Peter Clarke, the second of four sons, in New York City, and grew up in Englewood, New Jersey. At the age of 12, he had his first theater experience, in a school production of My Fair Lady. He began to have serious ambitions to work in the theater at the age of 14. He graduated from Dwight Morrow High School in 1970. Shortly before he left the United States, Peters was arrested for obstructing police lines after an anti-Vietnam war demonstration but was cleared. He later said of this experience: "It made me more angry than anything else, because what I experienced was how impotent you could be as an American citizen." In 1971, Peters' older brother enabled him to work as a costume designer for a production of the musical Hair in Paris, in which Peters later starred. While there, Peters received a letter from the FBI that accused him of draft evasion. When he went to New Jersey to contest this charge, he said: "if the enemy comes to America, I'll be there, but I don't know the Vietnamese. If you put me in the army, I'm not going there." In 1973, Peters moved to London and changed his name to Clarke Peters, because Equity already had a few namesake members. While in London, he formed a soul band, The Majestics, and worked as a backup singer on such hits as "Love and Affection" by Joan Armatrading, "Boogie Nights" by Heatwave, and some David Essex songs. However, music was not Peters' main ambition, and he preferred to work in the theater. His first West End theatre musical roles, which he received with assistance from his friend Ned Sherrin, were I Gotta Shoe (1976) and Bubbling Brown Sugar (1977). Other West End credits include Blues in the Night, Porgy and Bess, The Witches of Eastwick, Chicago, and Chess. Peters starred in the Sean Connery space Western Outland (1981) as the treacherous Sgt. Ballard, and he played an almost wordless role as Anderson, a vicious pimp in Neil Jordan's Mona Lisa (1986). After writing several revues with Sherrin, in 1990 Peters wrote the revue Five Guys Named Moe, which received a Tony Award nomination for Best Book of a Musical. He followed this up with Unforgettable, a musical about Nat King Cole, which received scathing reviews. He also starred in the 2010 UK production of Five Guys Named Moe. As a stage actor, Peters has also appeared on Broadway. His performance in The Iceman Cometh (1999) won him the Theatre World Award, and he portrayed the shady lawyer Billy Flynn in the revival of Chicago in 2000 and 2003. In regional theatre he has appeared in Driving Miss Daisy, The Wiz, Bubbling Brown Sugar, Ma Rainey's Black Bottom, Carmen Jones, and The Amen Corner. In September 2011, Peters appeared on stage in a Sheffield Crucible Theatre production of Shakespeare's Othello, playing the title role opposite his Wire co-star Dominic West, who played Iago. In the 2014 New York Shakespeare in the Park festival, he played Gloucester in King Lear. Peters is familiar to television viewers as Detective Lester Freamon in the HBO series The Wire. Peters also starred in the HBO mini-series The Corner, portraying a drug addict named Fat Curt, as well as the FX series Damages, as Dave Pell. Both The Wire and The Corner were created by writer and former Baltimore Sun journalist David Simon. Peters also stars in Simon's HBO series Treme, in the role of Mardi Gras Indian chief Albert Lambreaux. Peters appeared in two episodes of the U.S. time-travel/detective TV series Life On Mars (2008) as NYPD Captain Fletcher Bellow. He also appeared in the UK show Holby City, as Derek Newman, the father of nurse Donna Jackson. He voiced a part in the Doctor Who animated episode Dreamland, and in the In Plain Sight episode "Duplicate Bridge" as a man in Witness Protection named Norman Baker/Norman Danzer. In 2010, Peters read Rita Hayworth and Shawshank Redemption for BBC 7. In that year, he also had a guest appearance as Professor Mark Ramsay in the pilot episode of the USA Network TV series Covert Affairs. Since 2012, Clarke Peters has had a recurring role as Alonzo D. Quinn in the CBS TV series Person of Interest. His big screen credits include Mona Lisa (1986), Notting Hill (1999), K-PAX (2001), Freedomland (2006), Marley & Me (2008), Endgame (2009; in which he played Nelson Mandela), Nativity! (2009), the Spike Lee film Red Hook Summer (2012; in which he played Bishop Enoch), and Three Billboards Outside Ebbing, Missouri (2017). Peters narrated the audiobook version of Michael Chabon's novel Telegraph Avenue, released in September 2012 by HarperAudio. Peters has had five children from three relationships. He and his first wife, Janine Martyne, who sang with him on recordings, had two children: a daughter, China Clarke, an architect, and a son, Peter Clarke, a tattoo artist. A subsequent relationship with Joanna Jacobs produced two sons: Joe Jacobs, an actor, and Guppy, who died of a kidney tumor in 1992, at the age of four. He has a son, Max, with his second wife, Penny; Max played the young Michael Jackson in the West End production of the musical Thriller – Live. Peters splits his time between a house in the Charles Village section of Baltimore, which he bought in 2006 while working on The Wire, and one in London, where Penny and Max live. He is a follower of the Brahma Kumaris. 1983 The Professionals President Ojuka Episode: "The Ojuka Situation"
1985 Travelling Man Alan Downing Episode: "A Token Attempt"
1991 El C.I.D. Sultan Episode: "Christmas Spirit"
1993 Between the Lines Mr. Banthorpe Episode: "Jumping the Lights"
1994 Murder Most Horrid American Episode: "Mangez Merveillac"
1995 Chandler & Co Jasper Episode: "The American Dream"
1996 French and Saunders Lt. Johnny Cochrane Episode: "The Quick and the Dead"
2000 Oz Afsana Episode: "The Bill of Wrongs"
2005 Law & Order: Trial by Jury Rex da Silva Episode: "Pattern of Conduct"
2009 In Plain Sight Norman Baker / Norman Danzer Episode: "Duplicate Bridge"
2009 Great Performances Walter de Courcy Episode: "Chess in Concert"
2010 Covert Affairs Dr. Mark Ramsay Episode: "Pilot"
2011 Memphis Beat Fred Episode: "The Feud"
2013 Blue Bloods Nathan Anderson Episode: "Quid Pro Quo"
2014 True Detective Minister Episode: "The Long Bright Dark"
2014 Death in Paradise Marlon Croft Episode: "Political Suicide"
2015 Forever Jerry Charters Episode: "The Wolves of Deep Brooklyn"
2015 London Spy The American Episode: "Strangers"
2015 Midsomer Murders Frank Wainwright Episode: "The Ballad of Midsomer County"
2016 People of Earth Ronald Episode: "Lost and Found"
2017 The Deuce Melvin "Ace" Episode: "My Name Is Ruby"
^ a b c d e f g "Clarke Peters: From The Wire to Nelson Mandela". The Independent. April 30, 2009. Retrieved November 7, 2011. ^ Apter, Kelly (August 3, 2010). "The Wire's Clarke Peters in Fringe run of Five Guys Named Moe". The List. Retrieved August 27, 2018. ^ "Clarke Peters CV... 1970: Graduates from Dwight Morrow High School in New Jersey." ^ a b c d e f Hattenstone, Simon (August 8, 2010). "Clarke Peters: Razzle dazzler". The Guardian. Retrieved November 8, 2011. ^ Anthony, Andrew (September 4, 2011). "Dominic West and Clarke Peters: 'We love each other's company'". The Guardian. Retrieved September 28, 2017. ^ Soloski, Alexis (August 7, 2014). "King Lear in the Park review: John Lithgow is not quite every inch the king". The Guardian. Retrieved August 11, 2014. ^ Walker, Dave (June 5, 2011). "For local 'Treme' viewers, Clarke Peters brings Big Chief Albert Lambreaux to life". The Times-Picayune. Retrieved January 7, 2012. ^ "Life on Mars (TV Series 2008–2009) – Full Cast & Crew". Internet Movie Database. Retrieved December 3, 2013. ^ "Rita Hayworth and Shawshank Redemption", BBC Media Centre. ^ Clarke Peters on IMDb . Retrieved April 14, 2013. ^ "Audiobook Reviews: Telegraph Avenue". Audiofile. September 15, 2012. ^ Rich, Frank (April 9, 1992). "From London, a Celebration Of Louis Jordan and His Music". The New York Times. Retrieved February 7, 2013. ^ "The Wire podcasts: Clarke Peters". The Mark Steiner Show. March 7, 2008. Retrieved November 30, 2018. ^ Egner, Jeremy (July 27, 2012). "Clarke Peters in 'Red Hook Summer,' Directed by Spike Lee". The New York Times. Retrieved February 7, 2013. ^ Lewis, John (November 2012). "Academy Reward". Baltimore. Archived from the original on December 6, 2013. Retrieved February 7, 2013. Chilton, Martin (Culture Editor online) (July 5, 2013). "Clarke Peters and a journey across music". The Telegraph. Editorial Staff (October 23, 2006). "20 Questions With... Clarke Peters". What's On Stage. Inskeep, Steve (Host) (April 9, 2010). "David Simon And Clarke Peters On 'Treme'". Morning Edition. National Public Radio. "Interview: Clarke Peters – Down to the Wire". The Scotsman. August 24, 2009. Wikimedia Commons has media related to Clarke Peters.